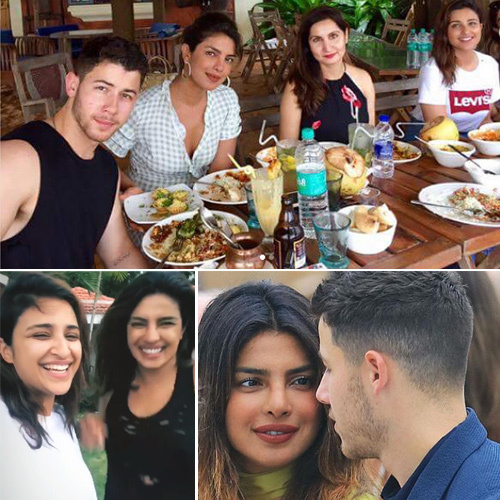 Priyanka Chopra took her boyfriend, American singer Nick Jonas, and her family on a vacation after landing in Mumbai on June 22. PeCee's cousin Parineeti Chopra has also accompanied them. Priyanka looked stylish in a cream coloured trenchcoat whereas Parineeti was seen in a casual avatar. The inside pictures of their Goa trip are doing rounds on the social media. Her bae Nick Jonas looks pretty comfortable with PeeCee's friends and cousin at the get together in beach paradise. Parineeti took to Instagram to share a video of Priyanka teaching her how to do the seductive Bollywood rain dance right... to the tunes of Akshay Kumar and Raveena Tandon's popular number Tip Tip Barsa Pani. Priyanka Chopra and Nick Jonas heading for a divorce!